I would put spending the Fourth of July in Washington DC on any list of travel experiences not to be missed. If you’re joining us this year (and we still have some rooms available including some special package deals if you haven’t made plans yet), here are a few of our favorite tips for having a great day. It’s generally hot in Washington and there’s a lot to see and do. Take a break, drink plenty of water, and be sure to get out of the sun for a while. If you’re at the Hamilton Crowne, you’ll be close enough to walk or metro back to the hotel without a lot of hassle. If you are planning to take metro, remember to have enough on your card for a round trip. Remember that the hotel is located closest to McPherson Square Metro but is also a quick walk from Farragut West (also on the Orange & Blue lines) as well as Farragut North (on the Red line). Make sure everyone in your party knows the address of the hotel in case you get separated and you have a designated meeting point (we recommend the patio at 14K so you can enjoy a refreshing drink and a snack while you wait for the rest of your group to arrive). The National Archives – Enjoy a special Fourth of July celebration with extended hours and activities all weekend where you can see the Charters of Freedom exhibit featuring the Declaration of Independence, the Constitution and the Bill of Rights. At 10 a.m. on the Fourth, there will be a dramatic reading of the Declaration of Independence by historical re-enactors. 4th of July Parade – Stake our your viewing spot early along Constitution Avenue for the 4th of July parade to enjoy the bands and floats. Smithsonian Folklife Festival – This year’s festival centers around the themes of The Smithsonian Inside Out, Mexico, and Asian Pacific Americans. There’s a full schedule of events for the fourth of July as the entire weekend. See the full schedule. 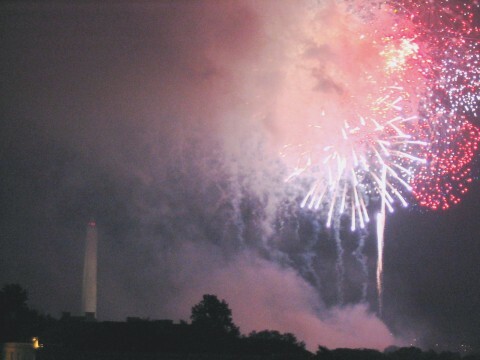 Concert on the Mall – Jimmy Smits will be hosting the Capitol Fourth concert and will feature performances by Darius Rucker, Reba McEntire, the National Symphony Orchestra, the U.S. Army Ceremonial Band and the U.S. Marine Drum and Bugle Corps. Fireworks – The Examiner offers a great review of where to get the best vantage point for viewing the fireworks. If you’re planning to attend the Concert on the Mall or watch the fireworks, keep in mind that there may be restrictions as to what you can take through the security checkpoints (such as no furniture or alcohol). You are currently browsing the Hamilton Crowne Plaza Hotel Blog blog archives for June, 2010.